Lock in a great price for Al Ahsa InterContinental – rated 8.1 by recent guests! Friendliness right from the security at the main entrance to the staff making the stay as if you are a King. Overall Quality and facilities as well comfortable room. The location is nice and the staffs are really accommodating. Staff were helpful and I got nice rooms. The food was good and in-room Iftar menu was excellent. The aircondition was extremely cold, which I loved. All was nice but Wifi was very weak and no Shisha place. Al Ahsa InterContinental This rating is a reflection of how the property compares to the industry standard when it comes to price, facilities and services available. It's based on a self-evaluation by the property. Use this rating to help choose your stay! One of our top picks in Al Hofuf.Designed in the style of the 16th Century castle, the 5-star InterContinental offers spacious and comfortable accommodations overlooking the Oasis of Palm Trees. Free WiFi is available throughout the entire property. 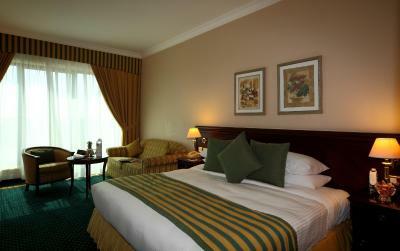 The Al Ahsa InterContinental has 166 beautifully furnished and neatly decorated guest rooms. Each over-sized room has many modern facilities including satellite TV and private luxury bathrooms. Guests at the InterContinental Al Ahsa will appreciate the fantastic choice of restaurants at the hotel. There are 4 different dining venues in total, ranging from Mediterranean to Asian to Arabic cuisine. Leisure facilities at the hotel include an indoor swimming pool, fully-equipped gymnasium plus sauna and steam rooms. Turkish and Moroccan baths are just some of the treatments the spa has to offer. 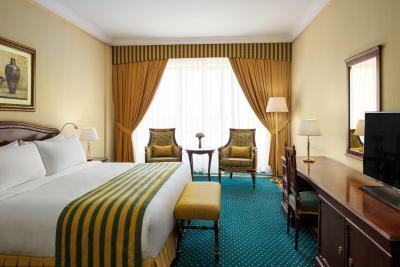 The Al Ahsa InterContinental is a short drive from important sites such as the Joatha Mosque, Qaser Ibrahim, the old Kaisariah Market and Qara Mountain. Oqair beach is an hour away and is one of the most frequently visited tourist destinations in Al Ahsa. This property also has one of the top-rated locations in Al Hofuf! Guests are happier about it compared to other properties in the area. When would you like to stay at Al Ahsa InterContinental? This air-conditioned King Room features a flat-screen TV, a mini-bar and a desk. It also features access to the club lounge where guests can enjoy WiFi, buffet breakfast and cocktails. This Deluxe King room oasis view is equipped with a work desk, free WiFi, flat-screen TV, a hairdryer, an alarm clock, a safe box, ironing-board and tea/coffee making facilities. Express check-out upon request. This Three-Bedroom Duplex Villa features an office desk, free WiFi, a flat-screen TV, a safety deposit box, an ironing-board and tea/coffee making facilities. Express check-out is upon request. This Royal Suite features a flat-screen TV, free WiFi, dinging space and a kitchen. The bathroom is fitted with a Jacuzzi and shower. Guests can enjoy all-day facilities of the Club Lounge. Royal Suite can be connected to two extra bedrooms. This Deluxe King room features an oasis view. It includes an office desk, free WiFi, a flat-screen TV, hairdryer, alarm clock, safety deposit box, an ironing-board and tea/coffee making facilities. Room bed type preference is subject to availability and cannot be guaranteed. House Rules Al Ahsa InterContinental takes special requests – add in the next step! One older child or adult is charged SAR 75 per person per night in an extra bed. Al Ahsa InterContinental accepts these cards and reserves the right to temporarily hold an amount prior to arrival. confort hostability from reception exelent decorations and furniture. In ganaral it’s an old hotel, it needs to be renovated. The customer service was poor and does not reflect the 5 stars hotel. It was very slow ansd there was only one person at the service. The location and the cleanliness of the place. I didn't get the room I booked..
looks like old five starts hotel.